(SPOILERS) I was never the greatest fan of Independence Day, which is probably why it has taken me a full 20 years to revisit it, and only then for the sake of referencing with regard to its belated, forlorn follow-up. 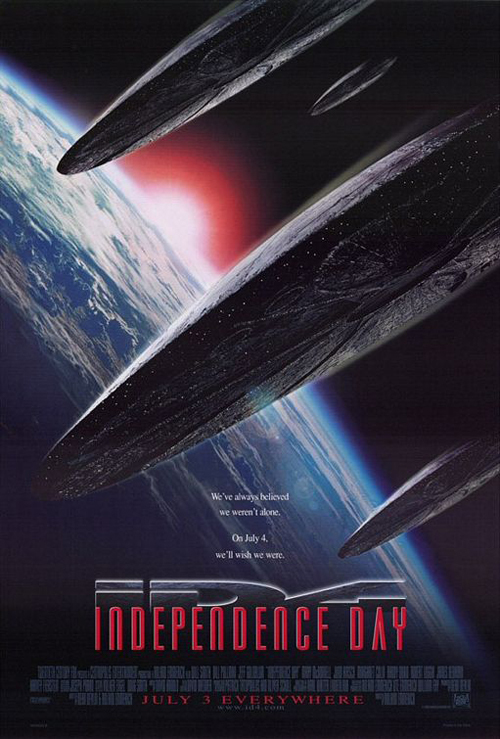 ID4 is a difficult film to actively dislike, just as it’s a hard to one to come out swinging for. Its pertinent problems and common complaints are at least partly intentional, based on its makers’ bizarre notion that the ‘70s disaster movie genre was some kind of worthy template to strive for and reinvigorate. That the picture hits its marks in this regard will likely be some measure of your tolerance for its content, but mostly its lustre is down to showing off Will Smith and Jeff Goldblum at the height of their powers. Oh, and Randy Quaid, wherever he may currently be hiding, proudly sporting an industrial strength tinfoil hat. For my money, director Roland Emmerich later bested ID4’s dubious template with the giddy end-of-the-world overkill of 2012 (no movie featuring a limo outpacing the San Andreas fault can be slighted for lack of self-awareness). But, while there was no guarantee this was going to be a mega-hit, as the makers have been fond of repeating in the run-up to the sequel, its promotional campaign and nuts-and-bolts have the confidence of a sure-thing. Anyone would think Emmerich was James Cameron (he does love Aliens, of course), the way he teases out the introductory sequence for going on an hour before the obliteration begins. It’s a canny move, as anyone who had seen the trailers was essentially standing in-line for those money shots. And, on the way to that place, Emmerich and Devlin’s embrace of the corny and otherwise risible is so on-the-nose, it’s difficult to take as other than gently mocking. The only difference being, if this was, say, Joe Dante at the helm, you’d feel the satire seeping through. There’s an underlying lack of gleeful mischief here that may derive from Emmerich’s Teutonic gaze. He can switch from the rousing to reducing at the cut of a scene. So there’s a swathe of fetishised images of the great US of A (that waving flag, even on the Moon) followed by the relish of mass destruction as its iconography is laid to waste, followed by that ridiculously hokey rousing speech from Bill Pullman (recently invoked by Nigel Farage, of all people). Because there’s no mistaking this as all about America, not that it harmed the box office any (60% of the gross was international). There are occasional cuts to the indistinct rest of the world, notably including some of recent adversaries (Russia is one of the first to feel the shadow of impending doom, the damn commies), and unfettered clichés invoked (Iraqis and clipped Brits, working together; “About bloody time!”) And, for all the global basis of events, the reportage is a constant drip feed of Sky News. Well, obviously. Emmerich is stealing from his heroes throughout. He’s a very clean action moviemaker, perhaps his greatest strength, and he gets that from Spielberg, but he also gets his cues on science fiction from the same source. This is the anti-Close Encounters of the Third Kind, not just through being shorn of that film’s disarming immediacy and pregnant atmosphere, but by reverting to the cardboard currency of the disaster movies the wunderkind was at that moment eclipsing. There’s also the reversal of benevolent aliens by way of Aliens (asked “What do you want us to do?”, the succinct reply comes “Die!”), such that design-wise the trad Greys are mashed up with xenomorphs for results both derivative and unmemorable (the creatures are basically a bit crap, spindly flailing exo-suit limbs aside). In the face of superior firepower, the Earth America is shown to be amusingly ineffectual, such that their traditionally aggressive posturing (“Nuke ‘em!”) is pitifully inadequate, and, as has been noted, it is left to an assimilated Jew and a middle-class African American (and a blue collar drunk…) to come up with the goods and preserve the status quo. As for the alien-defeating solution, it’s not like the cheesy computer virus thing hasn’t been used since. And, I suppose, if you’re looking for rigour in that regard, you’ve started watching with entirely the wrong presuppositions. The grand climax also incorporates a reworking of the old vulnerable Death Star trope, but that never gets old (it seems, eh JJ? ), and particularly since the other steals are all from Spielberg and Lucas, the ones that aren’t The Poseidon Adventure and The Towering Inferno, it’s probably appropriate. Of the alien aspect, I rather like the (verisimilitude?) that the President doesn’t know about Area 51, or aliens (and the real guy still doesn’t, right?) However, in this particular conspiracy, the plot requires all that previously discovered alien tech to have been sitting there doing nothing for 40 years, rather than feeding into a covert US space programme and various assorted mainstream technological advances (we have the sequel for that, and not just in respect of Kevlar). If I don’t really care for Bill Pullman’s President, who rather lacks the necessary undermining of his jingoistic repose, Randy Quaid’s alcoholic Nam vet is good fun once you get past the early, quirkily-scored crop-duster scenes, by virtue of being so unapologetically goonish; he’s a near-summoning the spirit of Belushi in 1941, dying to get payback ever since aliens kidnapped him a decade before. This is another aspect of Emmerich maintaining the broadest of sweeps, corralling knowing ridicule at belief in aliens, cynicism at the government, patriotic fervour and the lampooning thereof, revelling in loss and grief and undercutting it; some of these choices work better than others. Indeed, much as I adore saving the lubbable dog (leaping from the path of an oncoming fireball, no less), there’s something a bit suspect that it comes in tandem with killing the camp gay guy (which is designed to get a laugh; both of these get call-backs in the sequel, naturally). And I could do without the risible scenes involving Mary McDonnell’s stricken First Lady. But the main reason this is such a breeze, its flaws failing to overcome its careless enthusiasm, is that, unlike most the director’s subsequent movies, the stars give it a pulse. I dare say it would have been a hit without Will Smith (“You’re not as charming as you think you are” – “Yes, I am”; that’s a star, right there) and Jeff Goldblum, but I doubt it would have been as big. Smith, in only his second major role (as in, as a lead in a big movie) shows definitively that he has made the transition from Bel Air, and delivers his character as ‘Will Smith who just happens to be a fighter pilot’ (an important distinction, as the sequel proves with its non-entity uniforms). One wonders if Liam Hemsworth hurting his hand when he punches an alien in Resurgence is a direct recognition of this. Goldblum is great, of course, a perhaps unlikely sci-fi go-to coming off Jurassic Park, and with its sequel just round the corner. His brand of quirk is so pervasive that he can effortlessly steal the funnies from Smith in any scene they share (“Yes, yes. Without the oops this time”). He’s somewhat burdened by onerously unsubtle eco-motivation (“You know how you’re always trying to save the planet?”), having to patch up his relationship with his wife (Constance Spano), and being delivered pep talks from dad (Judd Hirsch), and asked to dive into an impromptu drunk scene (even Jeff’s not so good that he can pull that one off), but his “Good morning, Dave…” when speaking to an alien computer definitely seals the deal. There’s also Brent Spiner, overacting as wildly as a man will when he’s afraid of forever-typecasting. He’s perhaps the least expected character to get an expanded role in the follow-up, but that’s what trying to make up for a Big Willie-sized hole will do. Many of the ID4 effects are rather quaint by modern standards (back projection, model work, real fire etc. ), and there’s an unvarnished quality that would inform Emmerich’s subsequent career. High concept, but with no messing about for depth or post-movie contemplation (recently he’s tried to reverse that trend, to resounding ridicule). Which is fine, but Independence Day is absent genuine wit and smarts too, aside from the easy-going charm of its leads, which separates it from the genuine cult classics of the genre; it isn’t a sufficiently clever dumb movie, making it unlikely that the sequel would have knocked it out of the park even if Smith had deigned to return.